The final nail in the coffin of Manitoba’s beloved energy efficiency program has officially been struck by the Pallister government. With the announcement of Efficiency Manitoba today, Manitoba Hydro’s PowerSmart program is set to wind down. 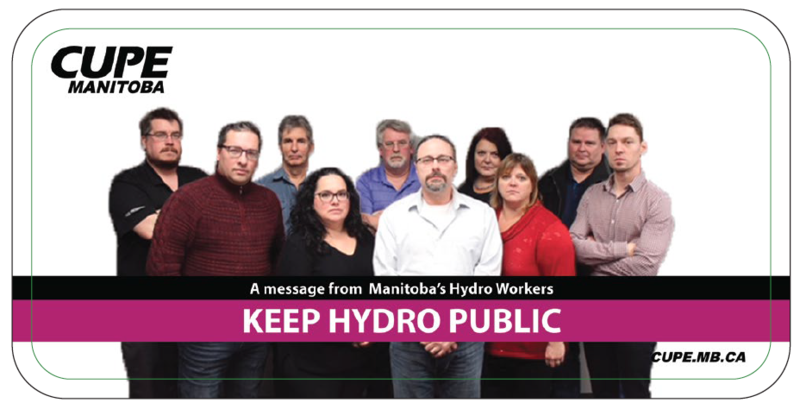 “The Pallister government’s carving out of Manitoba Hydro’s energy efficiency program is simply bad policy,” says Chris Mravinec, President of CUPE Local 998 representing Manitoba Hydro employees, including the PowerSmart program. CUPE Local 998 is calling on Manitoba Hydro and Efficiency Manitoba to ensure that PowerSmart employees are fairly transitioned into the new Crown. The government has not made a clear case for why creating a new Crown Corporation for energy efficiency is necessary, especially when PowerSmart is already so successful. It has also not provided details on exactly how the Crown will be staffed, financed, or how programs will be delivered. “This is another example of the government ignoring reason and pushing their agenda forward without details,” said Mravinec. In January 2017, CUPE 998 commissioned a poll that found 94% of Manitobans supported PowerSmart and 78% felt that PowerSmart should remain part of Manitoba Hydro.